On 27 October 2008 I attended my first ever "Be Very Afraid" event. Established by Stephen Heppell a few years ago, the idea of this occasion is, as I understand it, to give us teachers and educationalists a kick up the rear end -- in the nicest possible way, of course! The premise, in a nutshell, is that kids can do, and are doing, fantastic things, and we ought to know about them. Well, that has always been my guiding principle, so the idea of the event appeals very much. So, did the reality live up to the promise? I made several videos with children and young people at the event. Here they are; judge for yourself. 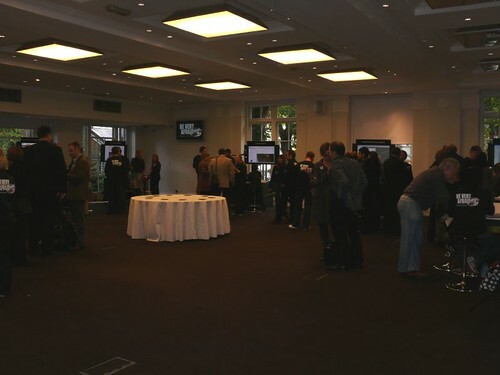 Before attending the event, I'd been under the impression that the focus would be on brilliant things the students were doing with educational technology. As it turned out, much of the students' ed tech skill set was pretty low level in my opinion. But the remarkable thing (which I don't regard as that remarkable, to be honest), was the extent to which the students were self-taught. 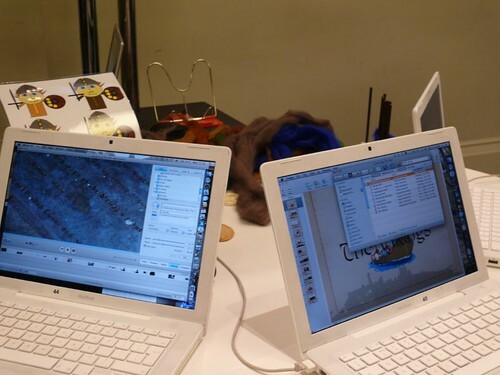 Also, the uses to which they were putting their skills and the technology were noteworthy. But the thing which stood out for me was how articulate and enthusiastic the young people were. You'll see this for yourself when you watch the videos. The eleven year old girl, for example. I was actually at that stand for close to an hour, and while she was explaining everything she had done, in minute detail, the ICT advisor from the area was chuckling away in the background, every so often giving me a look as if to say, "You;re going to be stuck here all afternoon!" Or take the seven year old boys. They were dead tired, and their teacher had to do most of the talking, but even so they had a good stab at saying what they'd been doing. And a thirteen year old girl from Juliette Heppell's class was so articulate that I asked Juliette if she worked in a very expensive private school. As it happens, her school is an ordinary school in an ordinary area in west London. I enjoyed the event for several reasons. First, it was a great chance to talk directly with young people, all of whom were delightful. Third, it afforded an opportunity to meet up with people I know, although the chats I had with them were fairly brief because we all wanted to talk to the young people and their teachers. One of the things that made the event successful was its laid-backness, if that makes sense, and you can see from the photo what a fantastic opportunity it was for professional development. Anyway, grab a cup of tea and settle down to watch the videos. That will take you around half an hour, which I think you will conclude was well-spent. Video 05: A student describes how she intends using the IT skills gained in her textiles classes, along with her artistic ability, to make some money! Video 09: More on the Nintendo dogs project, and its outcomes in terms of numeracy and business savviness! 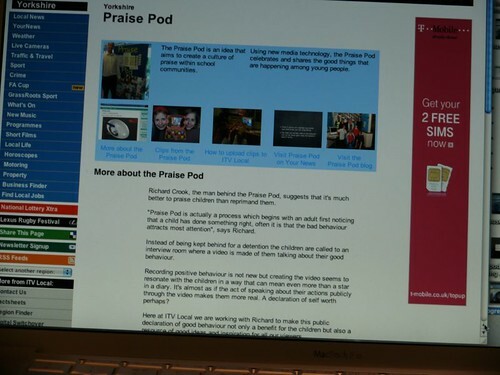 Praise Pod (Video 07) : Pupils learn interviewing techniques, and can zap your interview to your phone. 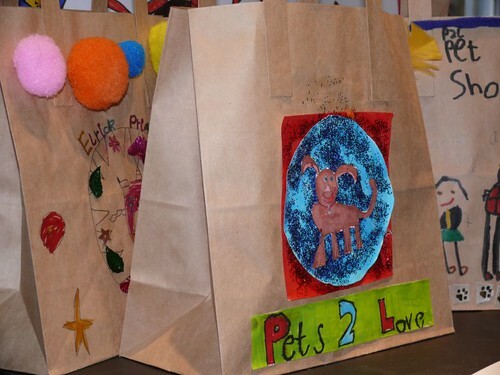 Nintendo dogs (Video 08) : The children decorated these bags as part of their project work. Artwork/design (Video 05) : Amazing artwork, which has the potential to earn money. The Vikings (Video 01). The children made the videos and slideshows, and uploaded them to the website. Could your pupils do that? Here's an idea for an in-service training activity for you and your colleagues. What was it about the projects that got the pupils so enthusiastic? Are there any common factors? If you have identified a few common characteristics, how might you try to reproduce them in your own situation? 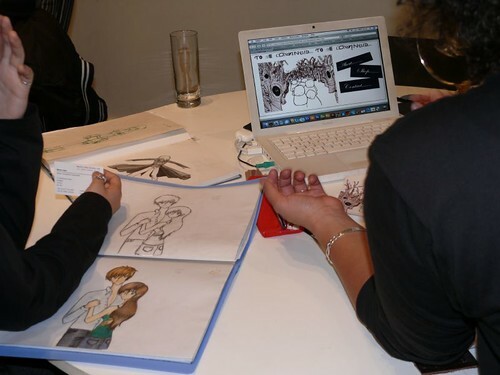 What steps can you take to enable your pupils to explain their projects as articulately as the pupils in the videos? Stephen Heppell and Lys Johnson, for organising the event. To read the Nintendo dogs blog, visit http://topdogs.edublogs.org. Please note that I have deliberately divorced the school names from the videos, and omitted the children's names. We obtained permission to take video and photos from the teachers concerned. This article was first published on 30th October 2008.